Our group will meet Wednesday morning (9/26/18) at 6:30am in BancFirst lobby located at 2500 S Cornwell, Yukon. Try to make it and consider inviting a guest. As The Lord does…He reminded me of something very simple over the weekend. What am I dwelling on? What am I reading, watching? I think God knows my ability to make decisions that are, let's say, "less than God honoring" when it comes to seeing, doing, thinking (about) things that do not "enlarge my horizon" with Him. So, He places quotes like this in my path – or awesome guys like you – to remind me of what is good and what I need to focus on each day. 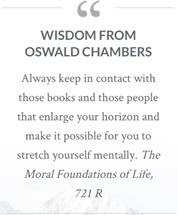 As Oswald indicates in this quote… I (we) need to "always keep in contact with those books and those people that enlarge our horizon and make it possible to stretch ourselves mentally." Years ago…I had this shirt with the verse reference of Philippians 4:8-9. The shirt has "shrunk" over the years but the verse rings true and is a bold reminder to dwell on things that will "enlarge [my] horizon" with God. The verse doesn't necessarily speak to hanging out with people or reading books specifically – so I am taking liberties – but you get what I mean. The end of verse 9 provides an awesome outcome…"put it into practice.And the God of peace will be with you."